Protection Engineering Consultants is pleased to congratulate Marlon Bazan on his 10 year anniversary with the company! 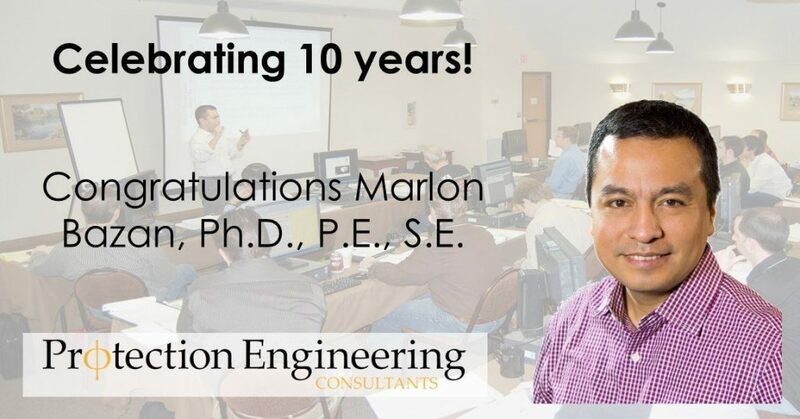 In the last 10 years, Marlon has become a recognized expert in the field of blast resistant design, expanded his impressive technical skills, earned his Structural Engineering license, established an outstanding professional reputation, developed a set of loyal clients and led many webinars and short course sessions. Marlon has helped build PEC through hard work and dedication and, as he expands his leadership role, will be a key part of PEC’s continued success in the years ahead! We are proud to recognize Marlon’s great service to this company, his dedication to consistent high-quality work, and his positive can-do attitude. We look forward to working with Marlon for many more years.